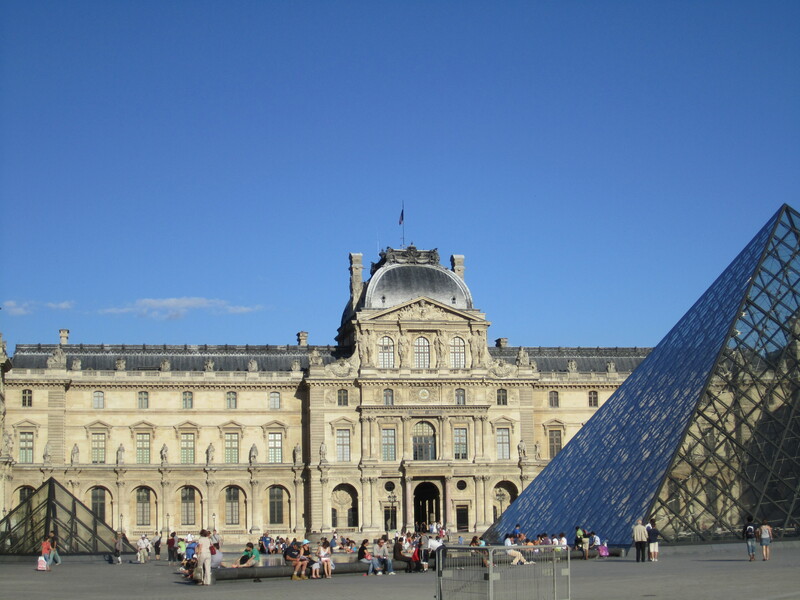 The Louvre Museum attracts crowds from morning `til night--on the inside and the outside! As I was lying on the floor of the Louvre Museum just outside of the Mona Lisa viewing room it occurred to me that being attended to by an ultra-friendly and very helpful American doctor who was trying to get my blood pressure under control was not in the least how I envisioned this tour going! 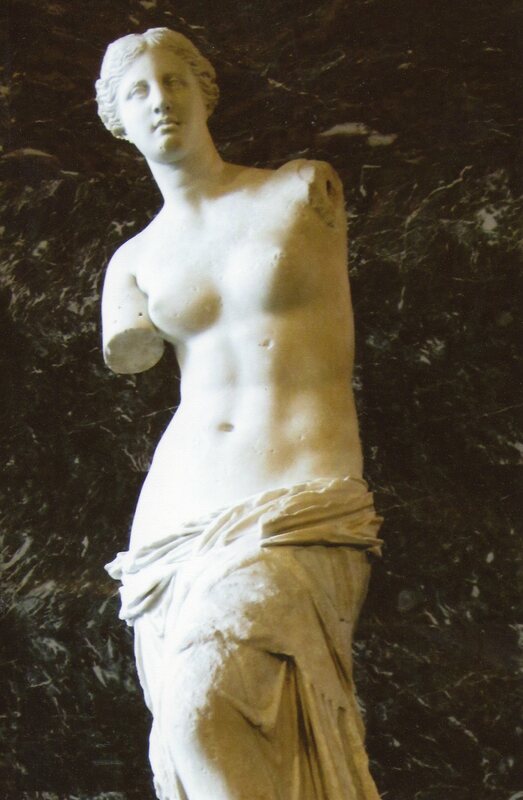 The famous Venus de Milo statue is just as beloved as the Mona Lisa painting in the Louvre Museum. With hundreds of museum visitor eyes staring down at me and frantic museum staff trying to push aside said American doctor and ascertain for themselves what was wrong, I felt like I had become the latest work of art on display, but I wasn`t really interested in being viewed. In an attempt to maintain some semblance of dignity, I tried to ignore the gathering crowd and instead focus my energy on listening to the kind doctor`s words of instruction so that I could quickly regain my feet and rejoin my tour group. Mortified as I was, my sense of humour did not leave me and I managed to quip that the Mona Lisa simply took my breath away and at least all of this fuss would make for an interesting story after the fact, and it has! For those inquiring minds who want to know why I had a dizzy spell in the middle of the Louvre, it was due to a few factors that included being jostled about in the mob mayhem trying to get a picture of Madame Mona Lisa in a tightly packed and very warm room, having to stay in this steam-cooker environment to listen to explanations of other Italian masterpiece paintings as part of the tour, and just the mere fact of my immune system adjusting to being on foreign soil. 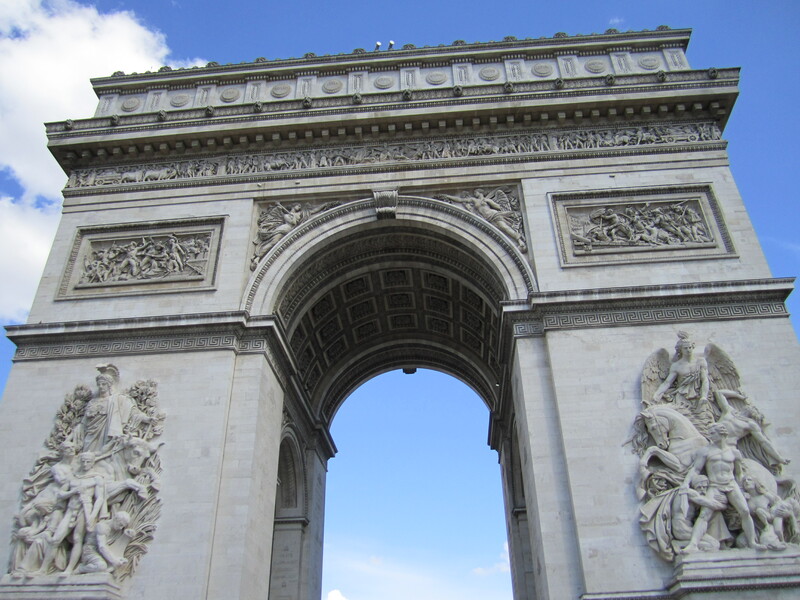 The whole incident was over just as quickly as it started for which I was grateful as there was so much more to see in this massive museum, and I had yet to explore the exterior gardens and the other gems of Paris that awaited along the Champs-Elysees. 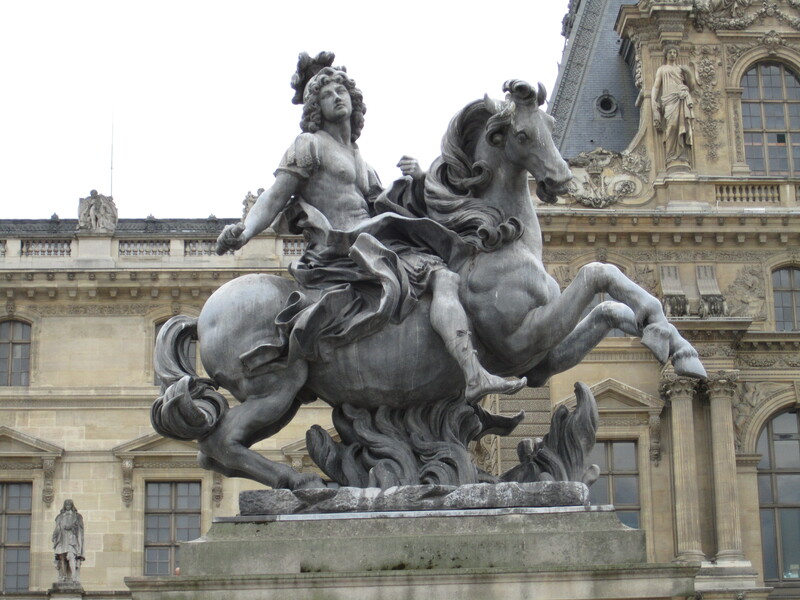 Youthful, lithe and enticing, The Sun King, Louis XIV, graces the exterior of the Louvre Museum. 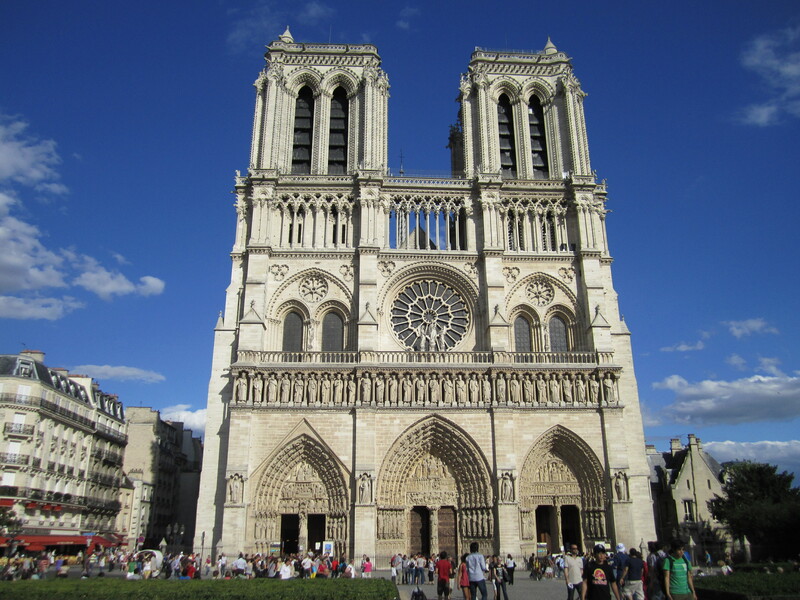 While the hysteria and antics at the Louvre have provided some of my Paris story fodder, there were other noteworthy occurrences to speak of such as the two faces of Paris that were revealed on a gloomy morning of wind and rain that turned into a glorious afternoon and evening of hot summer sun. 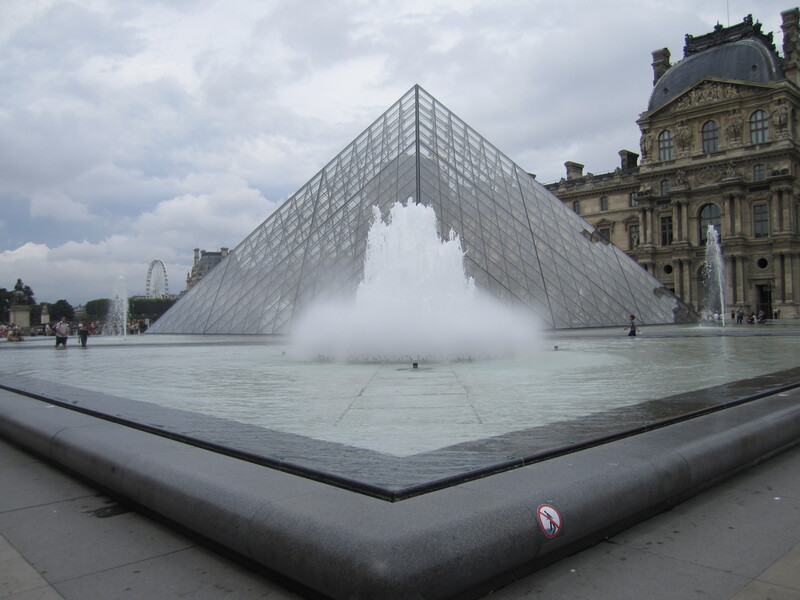 The contemporary and controversial glass pyramid outside the Louvre Museum. The Eiffel Tower was first-up on the morning agenda so it didn`t make for great picture-taking from the loftiest height in Paris, but nonetheless the great beauty and sheer expanse of the city was evident in walking the perimeter of the tower`s viewing balconies. 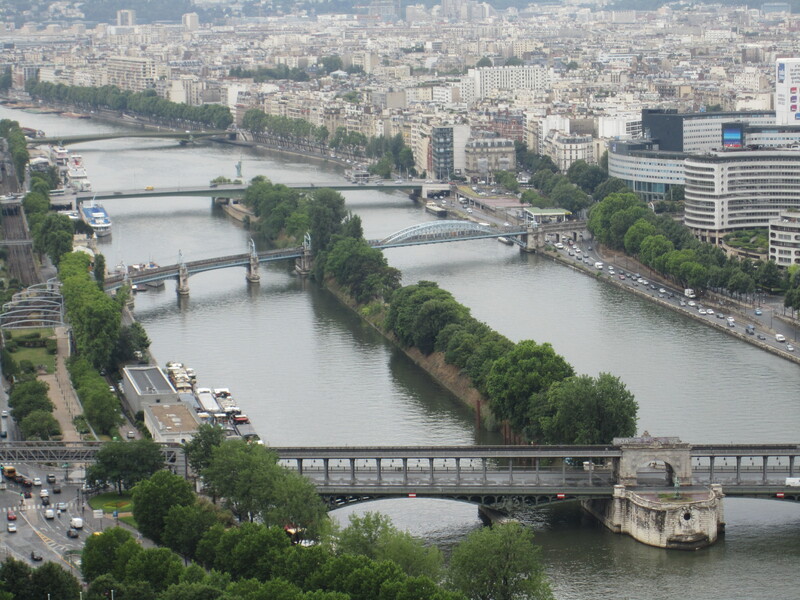 Some of the famous bridges of Paris as seen from the Eiffel Tower looking to the west. 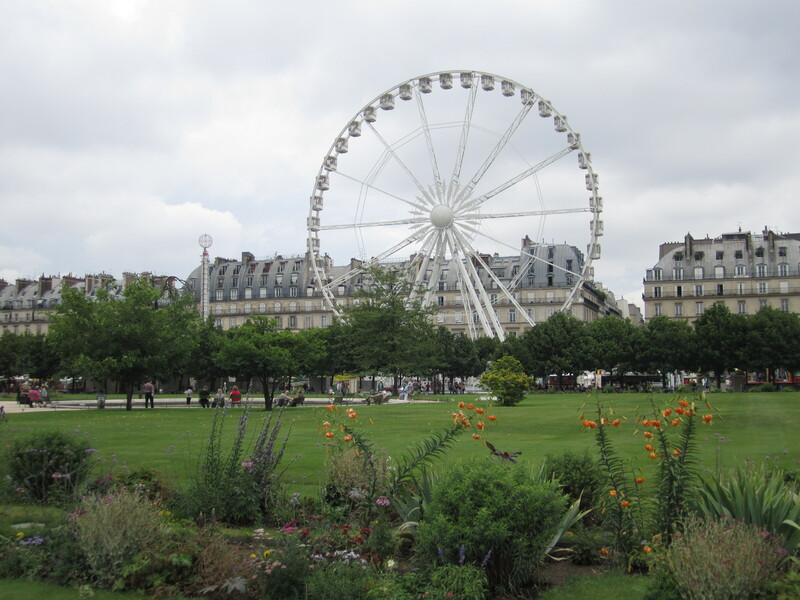 La Grande Roue (Ferris Wheel), Paris. The Louvre Museum tour followed and, although it was starting to clear by the time the tour ended, the sky was still gray as we exited into the Tuileries Gardens and began the march toward the Champs-Elysees passing the Luxor Obelisk, the Pont Alexandre III, and the National Assembly toward the Arc de Triomphe. 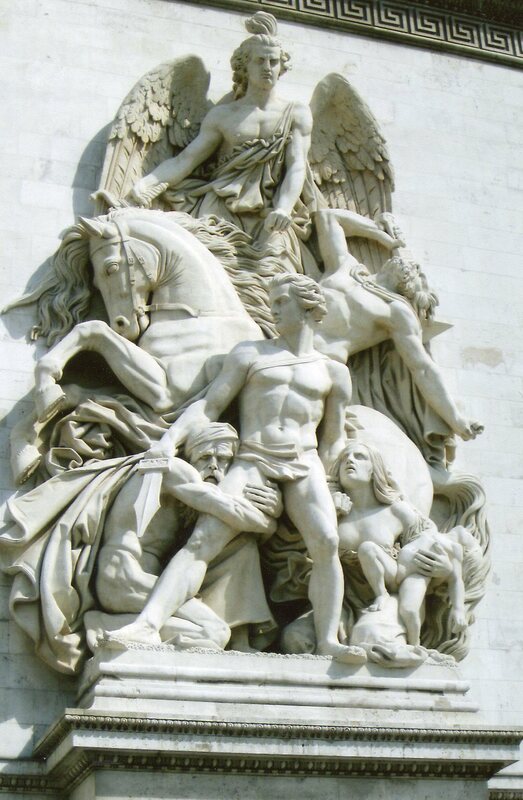 Close-up of carved relief on the Arc de Triomphe. 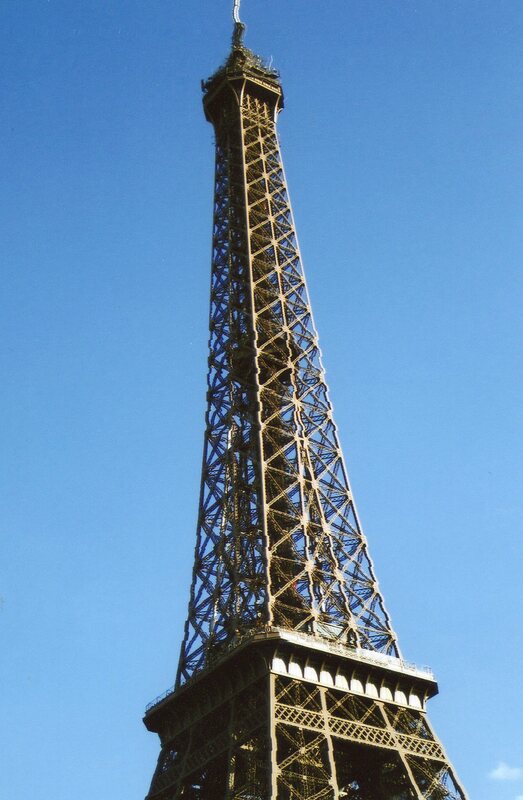 It was after a light bistro lunch that the sun finally revealed its warmth and the true colours of Paris were revealed. There is nothing like a vivid blue, cloudless backdrop of sky to bring stark and stoic buildings to life and provide plenty of photographic inspiration. My feet may have already been aching after making the trek from the Louvre to the Arc de Triomphe, but Notre Dame Cathedral was beckoning and, feeling well-fueled and no longer light-headed, how could I not return to the sites of the Louvre and the Eiffel Tower to capture these Paris lovelies now bathed in sunlight, so off I went back down the Champs-Elysees. I admit to hopping a cab between Notre Dame and the Louvre because it was now early evening at this point and the sun was starting to descend in the sky; other than that it was all hoofing it on foot and, yes, I paid the price the next day, but it was oh so worth it to see gay Paris in all its glittering and magnificent glory! 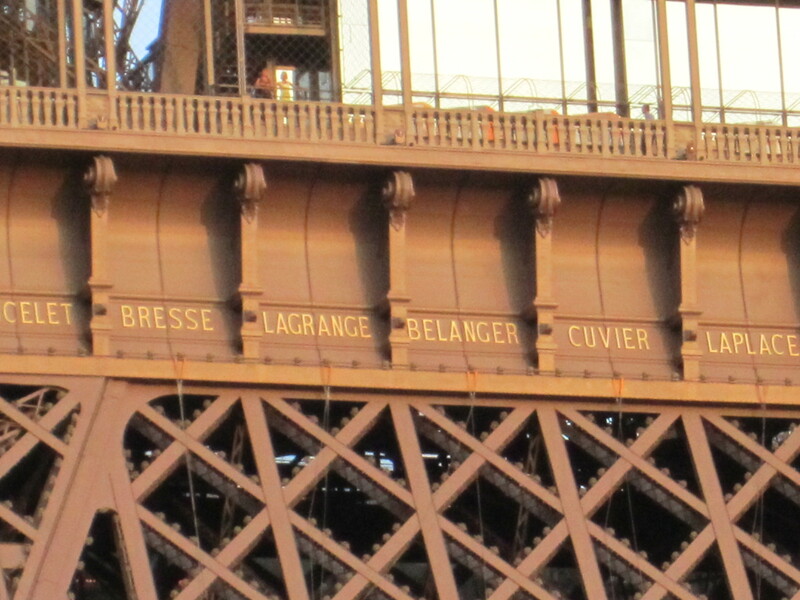 Steel detail from the Eiffel Tower. 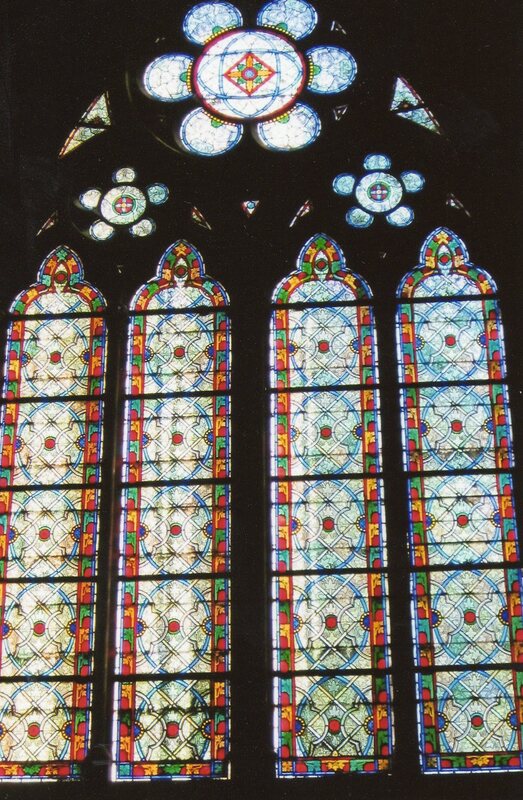 Stained-glass window interior shot of Notre Dame Cathedral. 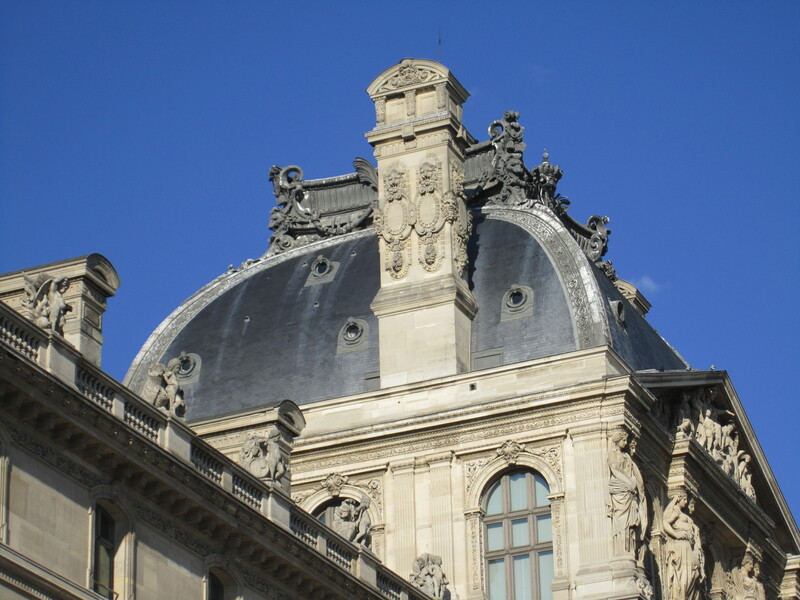 Roof-top detail of the Louvre Museum. 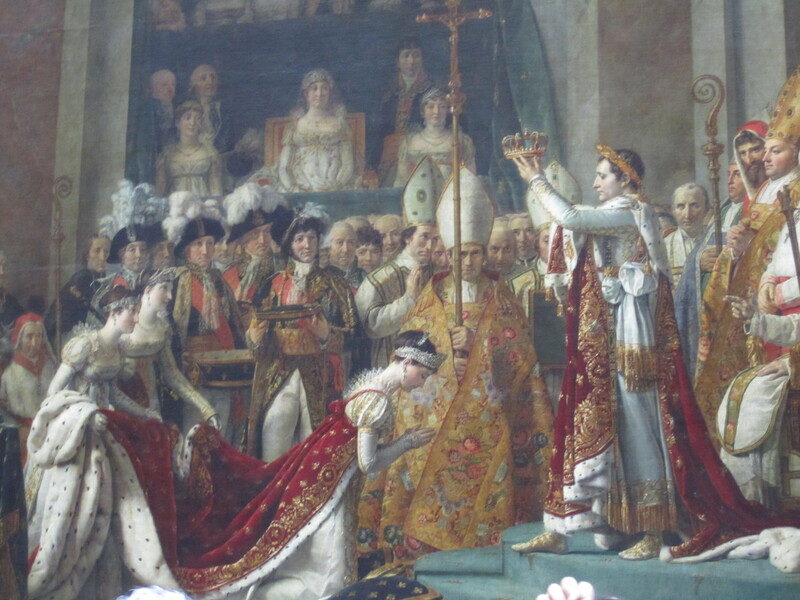 The Coronation of Josephine, David`s masterpiece on display at the Louvre Museum.